Or Yehuda, Israel, March 13 , 2014 – Formula Systems (1985) Ltd. (NASDAQ: FORTY) a global information technology company principally engaged through its subsidiaries and affiliates, in providing software consulting services, developing proprietary software products, and providing computer-based business solutions, today announced its results for the fourth quarter and full year ended December 31, 2013. On November 19, 2013 Sapiens International Corporation N.V., until then a majority-owned subsidiary of Formula, raised net proceeds of $37.8 million in a follow-on public offering, pursuant to which Formula's holdings in Sapiens were reduced below 50%. Formula's investment in Sapiens following the offering was accounted under the equity method of accounting. The gain recognized in 2013 in relation of the Company’s deconsolidation of Sapiens and related re-measurement to fair value of Sapiens amounted to $57.1 million and is presented in the income statement as equity in gains of affiliated companies, net. On December 31, 2013, Formula’s interest in Sapiens’ outstanding common shares was approximately 48.6%. Revenues for the Fourth quarter of 2013 increased by 6% to $209.5 million compared to $198.3 million in the same period last year. Following the deconsolidation of Sapiens' results as of November 19, 2013, revenues for the fourth quarter of 2013 excluded approximately $18.1 million of revenues recorded by Sapiens. Operating income for the fourth quarter of 2013, increased by 20% to $18.2 million, compared to $15.1 million in the same period last year; Non-GAAP operating income for the fourth quarter of 2013, increased by 6% to $20.8 million, compared to $19.6 million in the same period last year. Following the deconsolidation of Sapiens' results as of November 19, 2013, operating income for the fourth quarter of 2013 excluded approximately $1.7 million recorded in Sapiens and Non-GAAP operating income for the fourth quarter of 2013 excluded $1.9 million recorded by Sapiens. Net income attributable to Formula’s shareholders for the fourth quarter ended December 31, 2013 increased 736% to $62.6 million (or $4.38 per fully diluted share) compared to $7.5 million (or $0.53 per fully diluted share) in the same period last year. 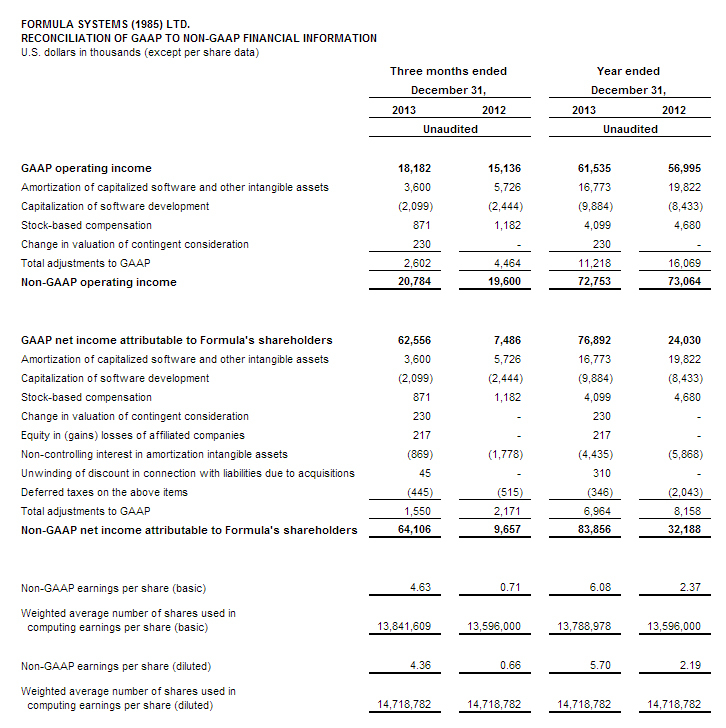 Non-GAAP net income attributable to Formula’s shareholders for the fourth quarter ended December 31, 2013, increased 564% to $64.1 million compared to $9.7 million in the same period last year. Revenues for the year ended December 31, 2013, increased 7% to $796.7 million compared to $744.7 million in 2012. Operating income for the year ended December 31, 2013, increased 8% to $61.5 million compared to $57.0 million in 2012; Non-GAAP operating income for the year ended December 31, 2013 totaled approximately $72.8 million compared to $73.1 million in 2012. 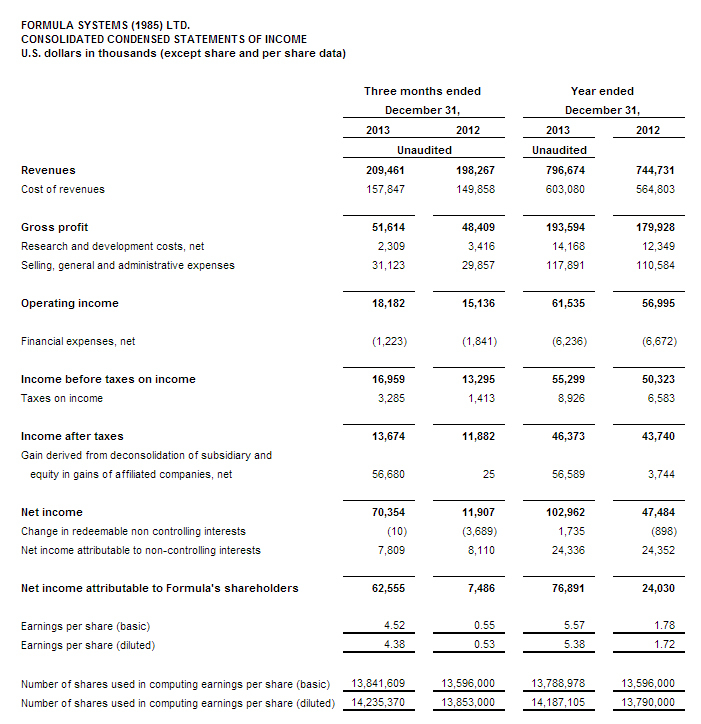 Net income attributable to Formula’s shareholders for the year ended December 31, 2013, increased 220% to $76.9 million (or $5.38 per fully diluted share) compared to $24.0 million (or $1.72 per fully diluted share) in 2012; Non-GAAP net income attributable to Formula’s shareholders for the year ended December 31, 2013, increased 161% to $83.9 million compared to $32.2 million in 2012. Formula’s consolidated cash and short-term and long-term investments in marketable securities totaled approximately $101.3 million, as of December 31, 2013. 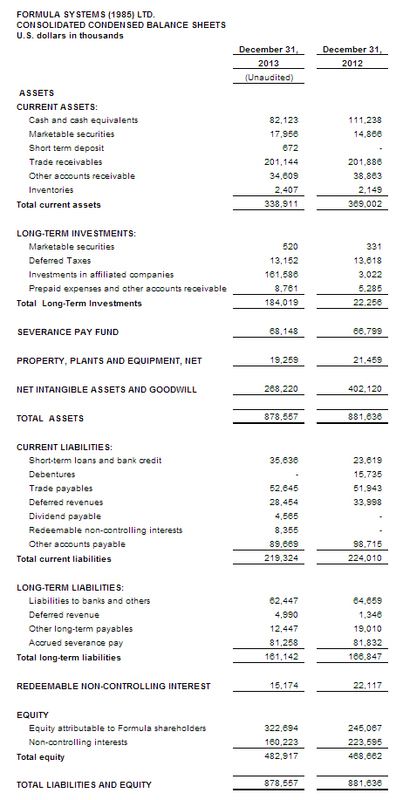 Total equity as of December 31, 2013 was $482.9 million, representing 55% of the total balance sheet. “In addition, in efforts to drive further growth, both Sapiens and Magic recently completed follow-on public offerings of common stock with net proceeds of $37.8 million and $54.7 million respectively. The success of these offerings demonstrates the market’s confidence in their existing markets, operations and growth strategy” concluded Bernstein. These non-GAAP financial measures are not in accordance with, or an alternative for, generally accepted accounting principles and may be different from non-GAAP financial measures used by other companies. In addition, these non-GAAP financial measures are not based on any comprehensive set of accounting rules or principles. Formula believes that non-GAAP financial measures have limitations in that they do not reflect all of the amounts associated with Formula’s results of operations as determined in accordance with GAAP and that these measures should only be used to evaluate Formula’s results of operations in conjunction with the corresponding GAAP measures. Please refer to the Reconciliation of Selected Financial Metrics from GAAP to Non-GAAP tables below.